Well, tomorrow is the day when the Oklahoma State Department of Education finally announces the 2018 OK Teacher of the Year. I'll be honest. I'm nervous. Mostly about the speech I have to give - not whether I win or not. I decided months ago that this entire process is in God's hands. He has a beautiful and perfect plan for my life. Part of that plan has involved getting to be a finalist for Teacher of the Year which has come with some pretty nice perks. As a first year teacher, I set a long-term goal that I would one day be Oklahoma Teacher of the Year. So, yes, I'd be honored to win. But, I will also say that the thought of leaving my classroom for a year to tour the state has me worried. For as long as I can remember, I have wanted to be a teacher. Now that I'm in my sixth year in the classroom, I can't imagine myself doing anything else. Tomorrow will have one of two outcomes. I will either hear my name announced as Oklahoma's Teacher of the Year, or I will hear someone else's name announced. Either way, I'm going to consider myself a winner. To win and have a chance to inspire teachers across the state during the 2018-2019 school year will be an honor. To get a chance to teach algebra to students for the 2018-2019 school year and continue doing what I love will be an honor. No matter the outcome, I can't lose! 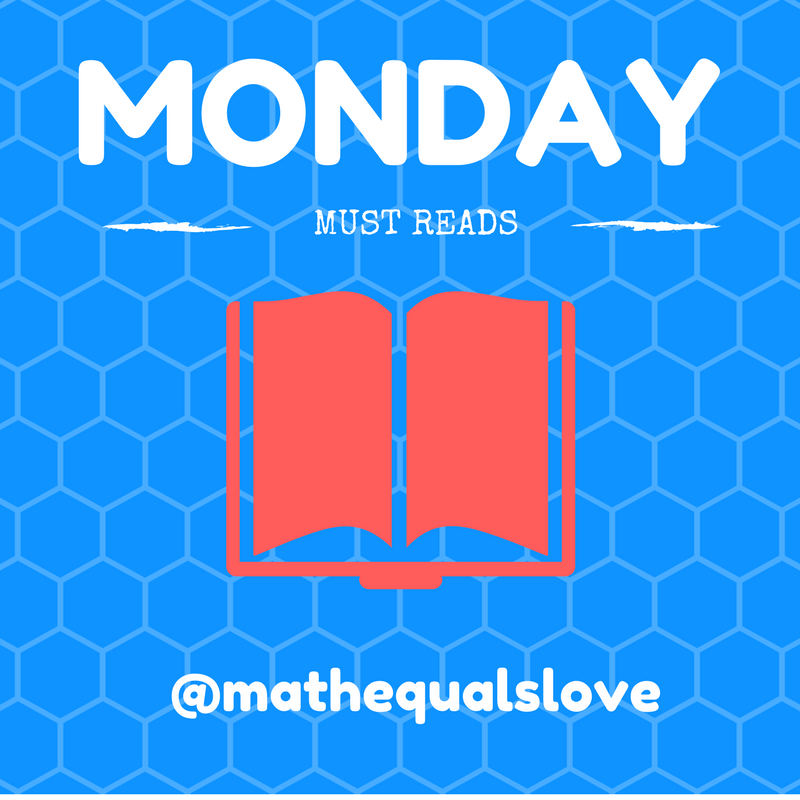 Now, to get my mind off this speech I need to give tomorrow, I present to you this week's Monday Must Reads! Here are this week's inspiring tweets! Tony Donaldson shares a photo of what a mole of different chemicals looks like. Last year, my physical science students really struggled to wrap their minds around the mole concept. This year, I'm teaching chemistry, so it is even more crucial that my students understand this tricky concept. I hope that letting them visually see a mole of something will help! Hayley created a mini maths key fob toolkit for the teachers at her school. I'd love to use this idea for practice structures. Then, I could just flip through the cards when I'm looking for an idea when lesson planning! Hayley has posted the file to download on TES for free here. I'm always on the lookout for new ideas for foldables. Mr. Fredericks shares a new-to-me foldable type in this post. Love the emphasis on definitions AND what each vocab word looks like! Randy L. Revels, Jr. shares a creative idea to get kids thinking in class. Using the top of your desk as a dry erase board, write as many things as you can think of about a certain topic. This idea won't work with the textured tables in my room, but I'm saving it here to keep it in mind for the future! 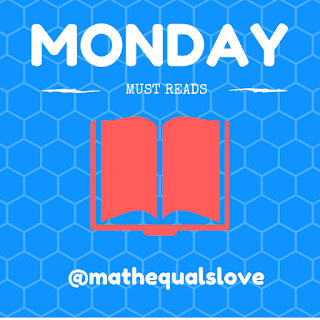 Are you doing #Teach180 or a 180 blog? Ben Wildeboer has created a calendar that lets you easily figure out the number of the day of school that corresponds to each date. My favorite thing is how customizable it is! Rick Barlow recently tweeted about an intriguing way to get students to buy into group work. He invited students to give public shout-outs to other students who took risks in problem solving. How awesome is that?!? Jake Valtierra is an assistant principal who shares ideas from classroom teachers. I love the idea of "Pin the Tail on the Number Diagram!" Katie Shonk combines three awesome things (SMARTBoards, Venn Diagrams, and Post-It Notes) to make something even more awesome! Tenille Cauley shares a new-to-me activity to give students practice working together in a group. The challenge: write a message without touching the marker! Mrs. Schneider had her students create beautiful pinwheels with facts about themselves on the other side. This would make beautiful classroom decor! Megan Tuttle poses an awesome puzzle to her students. It's like a clothesline activity without the clothesline. What does m equal? What order should the cards go in? Gina Stukenholtz has her students complete an enthusiasm and learning chart to get feedback from her students. LOVE this idea! Madi Roberts shares an awesome dry erase template she created. I also think this would make for an awesome foldable for interactive notebooks! Elissa Miller inspires with an awesome geometry lesson that involves pipe cleaners and fuzzy pom poms! I also love the card sort for Algebra 1! Ashley Brown shares a new-to-me idea for data collection: lucky numbers from fortune cookies! I love combining food with data collection in the classroom! Beverly Schroth brings chemistry to life by having students act out what happens to the charge and mass of an atom when electrons or neutrons are added or subtracted. Daniel Carlson found a quick way to get useful student feedback. I love the question about Desmos! And, for the record, I think it's impossible to use Desmos too much! Megan Joy combined one of my favorite practice structures, two truths and a lie, with technology in an awesome way! Stephanie Goldberg uses a simple office supply, a plastic sheet protector, to create a genius demonstration of the associative property. Katrina Newell shares an awesome relation/function card sort. Check out her blog post about it here. She has also shared a version of the same activity that doesn't involve any cutting and gluing. I've already printed it and put it in my unit binder for relations and functions! I don't teach biology, but I have to give a shout-out to Jen Winne for her creative use of pool noodles in teaching science! Julie Morgan shares a poster she created for her classroom to recognize one student each week based on their Numeracy Ninjas performance. LOVE this idea. I also love that the sign is laminated so it can be easily reused each week! Sarah Dimaria's students are performing a yummy stats experiment: are double stuffed oreos really double stuffed? Michelle Bailey created an awesome pass and fold activity to get her students practicing the concept of complementary angles in geometry. Kaytlin Black engages her students in reviewing the scientific method by analyzing thumb wars. How fun! Michelle Vanhala shocks her chemistry students by eating a candle. I've wanted to try this activity with students ever since I read about it last year. Thanks Michelle for the reminder. I'm definitely doing this with my chemistry class soon! Joel Bezaire wins the coolest teacher award for teaching his students how to build an enigma machine from a soda can! Math by the Mountain has been producing some awesome flow charts lately! Check out this one for classifying real numbers. Mr. Cooke shares an awesome wall display featuring a Pythagorean Tree! Until next week, keep up the awesome tweets and blog posts! Sarah, good luck with the announcement tomorrow. You are certainly teacher of the year or half-decade in my opinion. I have been inspired while reading your blog since I became a teacher in 2012. Now, students in my three schools in two states during that time have benefited with the strategies their teacher learned from your amazing work.